I met with my client earlier today, as I delivered one of my latest restoration projects. 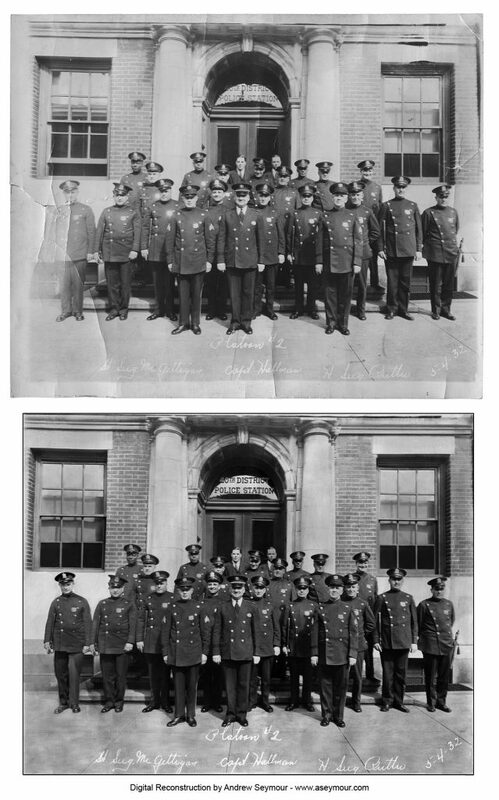 This was an image taken on May 4, 1932, of the Second Platoon, 40th District Police station in Philadelphia. Originally, I was presented with a rolled up image that was approximately 8 x 10 inches wide, and had a 3 inch tear on the left side, which made unrolling the image for viewing, let alone scanning, rather difficult. Once opened, one could easily see that there were cracks in the emulsion in several areas on the image, and that the left side had also undergone severe fading from the way it was stored. Looking at it with more detail, and listening to my client, his grandfather is the left most person in the image. I said that was going take some time, and gave him a rough estimate, which he accepted and I was on with my challenge! After finally being able to carefully layout the print onto my scanner, and doing a high-resolution scan, was I able to actually see black scratch marks, that had appeared to have been on the original negative. What I also found very interesting about this image, from a historical perspective, is that there are at least two black officers and I believe there is a third, and shows how the Philadelphia Police department was ahead of its time when it came to racial diversity. Thankfully, I was able to listen to several good books while I worked on the image, and after about 15+ hours of work, I was able to meet with him today, to return is original image and he was thrilled with the prints that he had ordered. Based on watching my client scrutinize the prints I had done, and his reaction during the meeting, and think it is safe to say, I saved grandpa! So if you have any images that you wish to be restored, please feel free to contact me for free quote. I was reading through my email this morning, and was happy to find out that Seymour Digital Imaging was voted Thumbtack BEST OF 2015! Needless to say, I want to Thank First and Foremost, my customers! It’s YOUR pictures and stories behind the images that really keep me going! A great unsung History in each image! I would also like to thank the folks at Thumbtack.com for helping to connect the Customers looking for quality Services! 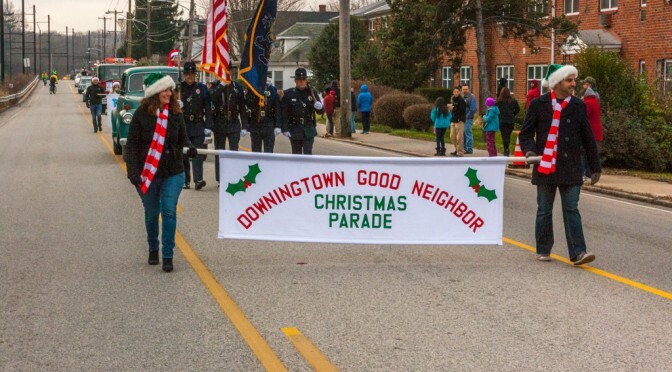 PS – I’m still located in Downingtown, near Lionville! I had a chance to work with the good folks over at County Lines Magazine again for their August special Supplement – “Stroll a Royal Mile… Malvern“! Back in the beginning of June, I got an email from Jo Anne Durako the Editor of the magazine and the writer, Emily Hart about the idea of the supplement, and during the course of the thread, we had an outline for the issue. On the First day of shooting, I took my two kids with me, as we walked King Street. 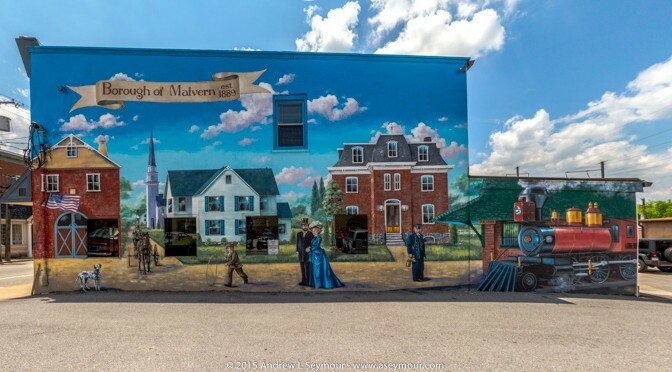 It was especially fun for me, because when I first moved down from Boston in 1993, I moved to Malvern, and lived there for a year. Since then, there have been many changes to the town, and it very much seems to being in a growth mode! that were used in the Malvern Supplement! So, if you get a chance, pick up a copy of the August issue of County Lines Magazine with the Special Malvern Supplement! If you are interested in seeing a PDF version of the article, Special Malvern Supplement. Hope you enjoy, and if you have any comments, please let met know!